Last week, prior to the dividend cut off date, there was a single day when Jobstreet had a very large transaction. I was sort of expecting Fidelity to be selling and it was true that the large block of some 14 million shares in a day. Who has been buying is unknown as well as why Fidelity has been selling is also unknown. The only thing that I am guessing is that since Fidelity owns a substantial block of Seek (as shown below), I would guess that it does not want to own as many stocks in Jobstreet during a period where it is critical to get shareholders approval for the deal. As it is, Seek already owns some 22.2% of Jobstreet, it does not help when Fidelity also owns a substantial block of the target. I am not sure if Fidelity is allowed to vote among the shareholders meeting although the submission papers does not mention that. Whatever is known is that for the deal to be approved, it will require 75% shareholders approval (with Seek abstain from voting). 75% is substantial. 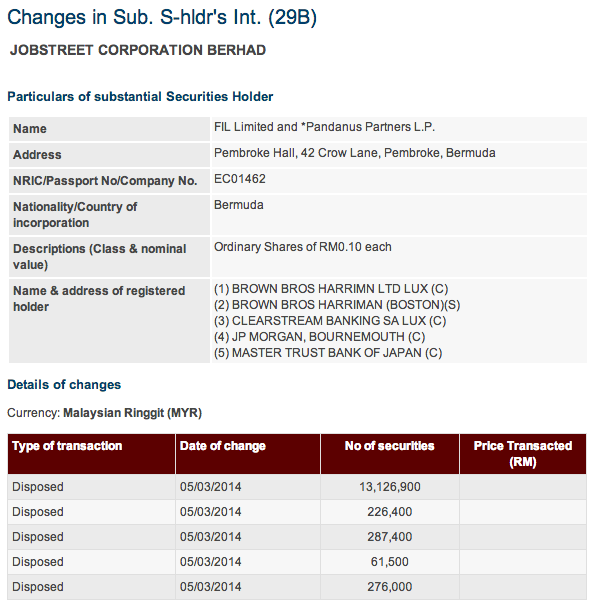 The large chunk of Jobstreet's shares were sold at RM2.41 prior to dividend (ex-date 10 March). The parties whom bought the large block from Fidelity off market would have made a handsome gain over a short period of time if Jobstreet is worth more than RM2.60. That's how the rich makes money, I guess! Quite true, remain to be seen. But i myself am not too keen on the deal. Have always look at Jobstreet as a company that can go alone, which is good for the industry. Jobstreet is definitely a good company. I am also trying to figure what is the potential downside to the current price if the deal does not go through.